Our first update for CRYENGINE 5.4 Preview includes a number of fixes and improvements. Almost all of these have been reported by you, our community and have been addressed by our in-house engineers. We are aiming to bring more frequent updates towards a full release of CE 5.4 - thank you for your continuous support! Fixed: Schematyc package not being de-registered - prevents possible crash on shutdown. Fixed: Issue where during load, Components are created and initialized sequentially, instead of being created in one batch and then initialized. Tweaked: Add VS2017 options to cry_cmake. Fixed: Crash when using Entity:SpawnArchetype in a new project not using the legacy IGame interface. Fixed: Possible crash when retrieving game token if graph was null. Optimized: Flowgraph integration - currently too unstable due to not implementing Flowgraph events correctly. Fixed: Schematyc Entity Components being created and initialized sequentially, instead of being created in one batch and then initialized. Fixed: Possible crash if managed plugin class was removed. Fixed: Crash during startup if plugin domain failed to initialize. Fixed: Crash if compilation of C# source files in assets directory failed. Fixed: Possible crash caused by the ability to undo selection of an invalid layer. Fixed: (FG) Crash when using undo/redo often (after adding a node) causes crash. Fixed: Opening any selection window once causes the property panel to flicker/redraw on each change. Fixed: (FG) Crash when using "q" to quickly (when adding a node) causes an instant crash. Fixed: Reverting a Component's properties in the Inspector recreates the entire Entity. Fixed: Crash when undoing layer deletion through context menu in Level Explorer, and then doing undo/redo. Fixed: (TrackView TV) Creating a key adds two events to the undo/redo-queue. Fixed: Optimized the moving of objects between layers (for large object counts). This issue could potentially stall the Sandbox Editor indefinitely. Fixed: (Open File dialog) Sort by size produces imprecise results. Fixed: (TrackView) Capture Track produces warning: End capture failed. Your Feedback is important to us - keep it coming! Thanks for your tremendous support and dedication, CryENGINEERS! Please keep in mind that this is still an experimental release and that you have to back up your projects before toying around with it. It's not proven in production, yet, so you shouldn't apply it to in-production games. Any feedback you are having, please check out this Official 5.4 PREVIEW dedicated Feedback Thread. Additional help can be found in our documentation, here. 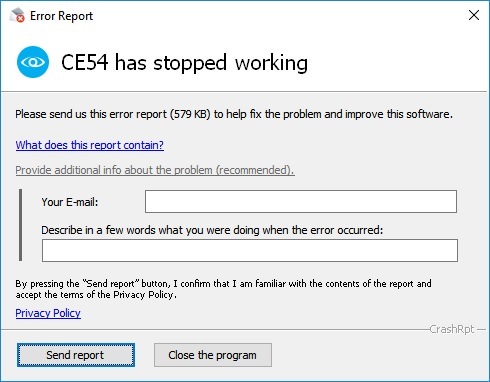 If the engine crashes, please consider sending a crash report via the pop-up and let us know what happened before it crashed in the notes - that helps us identifying issues quicker and addressing them faster; making for a more stable version for everybody in the next release. It seems like vs2017 is now supported. But it does not work anyway. <19:45:41> [Warning] <ThreadConfigInfo>: Active platform identifier string "pc" not found in config "%engine%/config/engine_core.thread_config". <19:45:41> [Warning] <ThreadConfigInfo>: Active platform identifier string "pc" not found in config "%engine%/config/engine_sandbox.thread_config". <19:45:41> [Warning] Config file %USER%/game.cfg not found! <19:45:41> [Warning] Config file user.cfg not found! <19:45:41> [Warning] Editor only supports DX11 & DX12. Switching to DX11 Renderer. <19:45:41> Localized language content(english) not available or modified from the original installation. <19:45:41> [Error] <Localization> No localization files found! what does your system.cfg and assets\game.cfg file look like? Will there be anything for Networking Multi Player coming with 5.4 or is it not planned yet? If No, then, May i Suggest a Doc for setting up a Multi Player Server as there is not one for CE V and when i asked, no one seems to know how.